Live Your Art: Off she goes! It's been awhile since I submitted anything for publication, so I mailed off two cards the other day for the "found stamps" call. I really wanted to make some Halloween ones, too, but I just haven't had the time. So, I decided that a funky dark envelope would have to do. Of course, I'm still playing with the carved stamps, and I finally used a cool background stamp that I picked up at MDW's Rockin Rummage Sale last month. 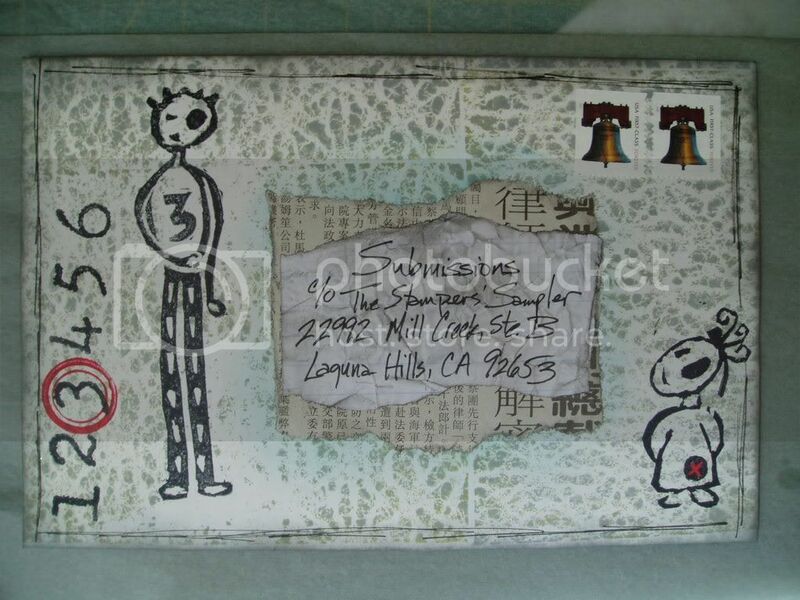 I LOVE number stamps, so they went on, too, but I am dying for the coolest number stamper I saw on Scrap In Style TV. It's like the kind they used to use to stamp library books, but it's HUGE. Gotta find it! Anyone knows who makes it?